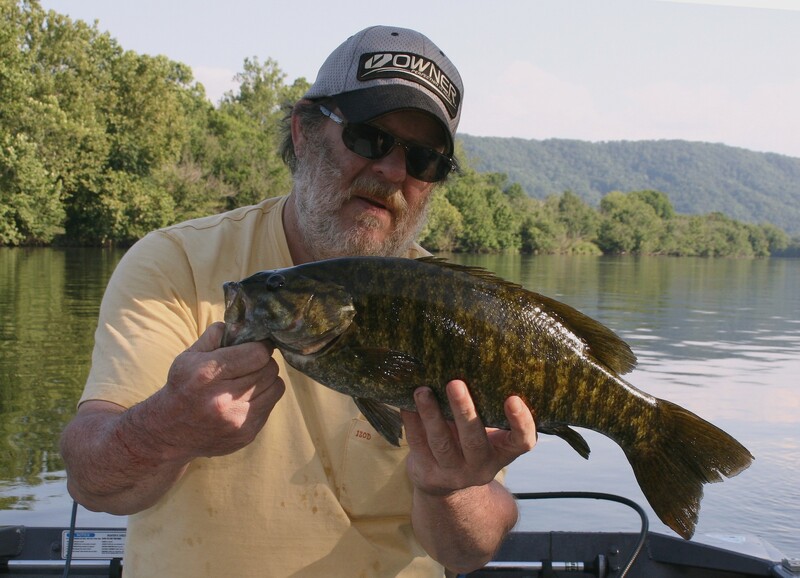 My long-time fishing buddy, brother-in-law and muskie fishing fanatic Rodger Davis with one of many smallmouths to come. 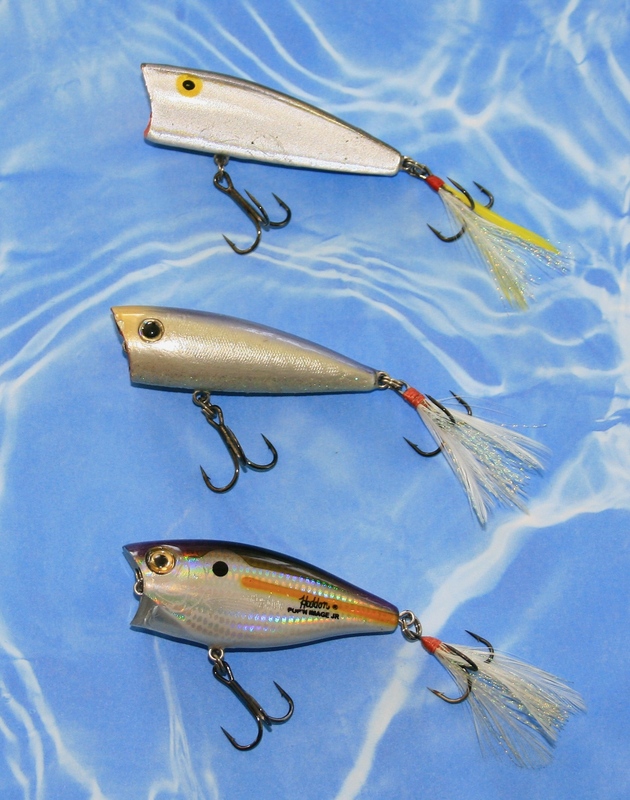 From the top, a few of my most reliable river surface lures: A Rebel Pop-R in Grey “G” finish, a Yellow Magic popper in Alewife, and a Heddon Pop’n Image Jr. in Tennessee Shad. 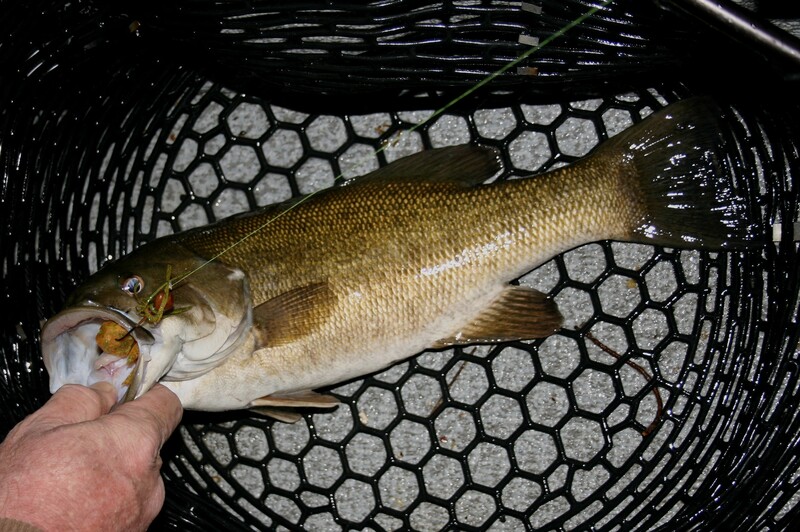 Popping lures make great search baits for river smallmouth bass because they can be fished quickly over any water depth. 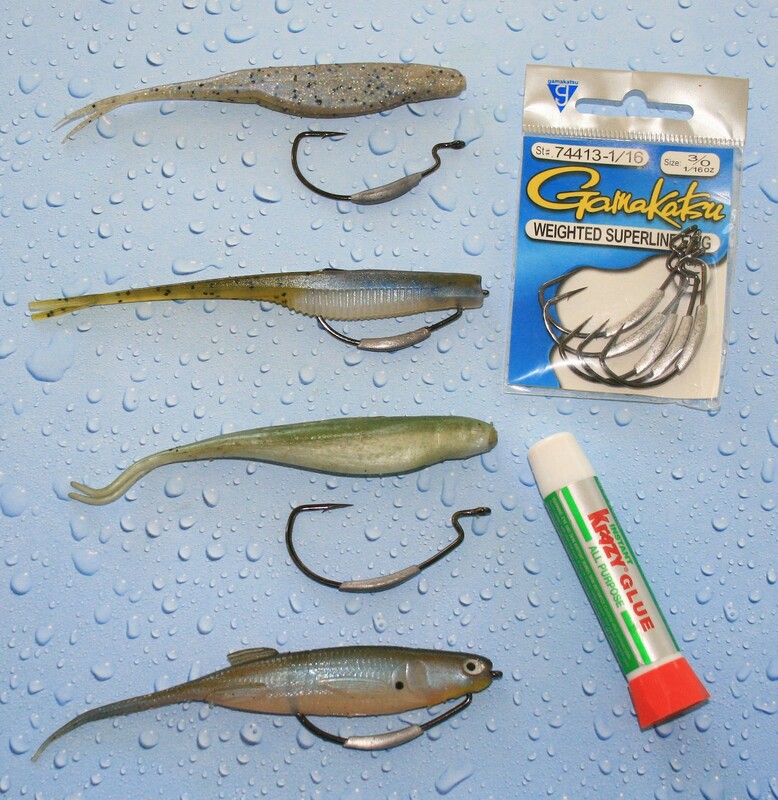 They’re good tools for locating fish and checking the smallmouths aggressiveness under current conditions. And many times, you’ll find them the best choice for all day fishing. 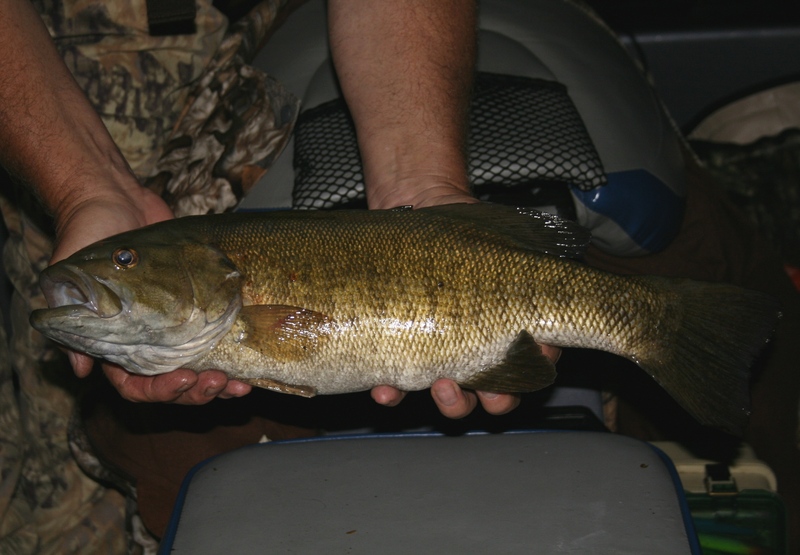 Soft-plastic stickbaits rigged weedless on weighted hooks are top choices for river smallmouth bass. Match the hook size to the size plastic you use to ensure good hook penetration; vary hook weight to match the water depth you want to fish. The key to proper rigging is making sure the bait is perfectly straight on the hook and the hook is centered in the plastic minnow’s body. Rigged properly, the lure will dart and glide erratically, much like an injured minnow. After rigging and testing the lure to check proper action, add a drop of super glue below the eye of the hook and along the shank where it passes through the lure’s body to hold the minnow in place. You’ll use fewer lures and present more realistic actions if each is super-glued to the hook before use. Lure color and brand isn’t important if the lure is properly rigged and weighted because we’ve caught plenty of fish on all these lures and colors the last few weeks. From the top, the Zoom Super Fluke in Blue Glimmer and Trigger X Minnow in Smelt have thinner bodies and match best with size 3/0 EWG (Extra Wide Gap) hooks. The Strike King Z Too in Arkansas Shiner and Castaic Jerky J5 in Bluegill at the bottom have larger circumference bodies and match best with larger 5/0 EWG hooks. I use 1/16-ounce Gamakatsu Weighted Superline EWG hooks in depths from one to four feet deep and 1/8-ounce models in slightly deeper water. 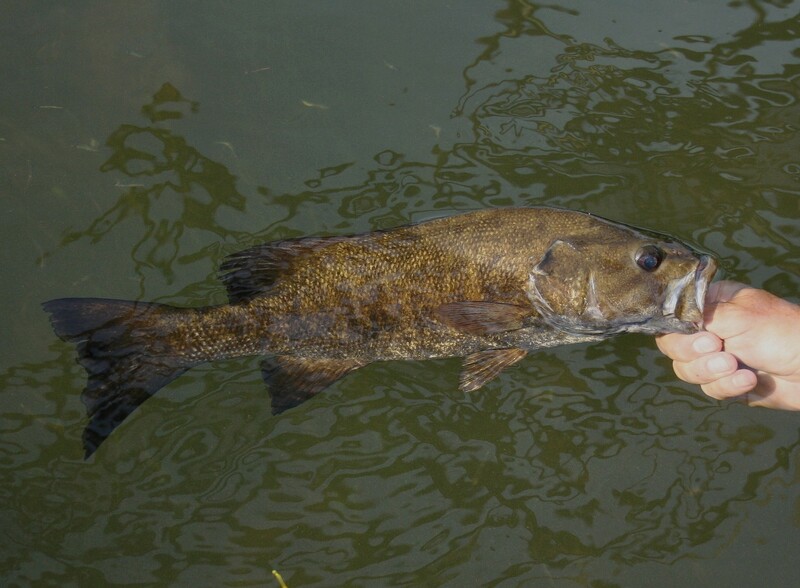 Smallmouth bass feed heavily on crawfish. A small jig with a double-tailed trailer duplicates the profile of a crawfish perfectly. The hair-flies I use at night for smallmouth bass in South Holston Lake are made by R&S Bait Company in Gray, TN. They’re a standard bucktail jig tied on an arkie-style head with a wrap of plastic skirt added. Hooks are light wire, an advantage because on a dead pull you can free many that snag, though the single wire weed-guard minimizes hang-ups. I use rootbeer colored jigs most but occasionally test the bass’s color preference by using other colors or adding color to plastic trailers with a marking pen. 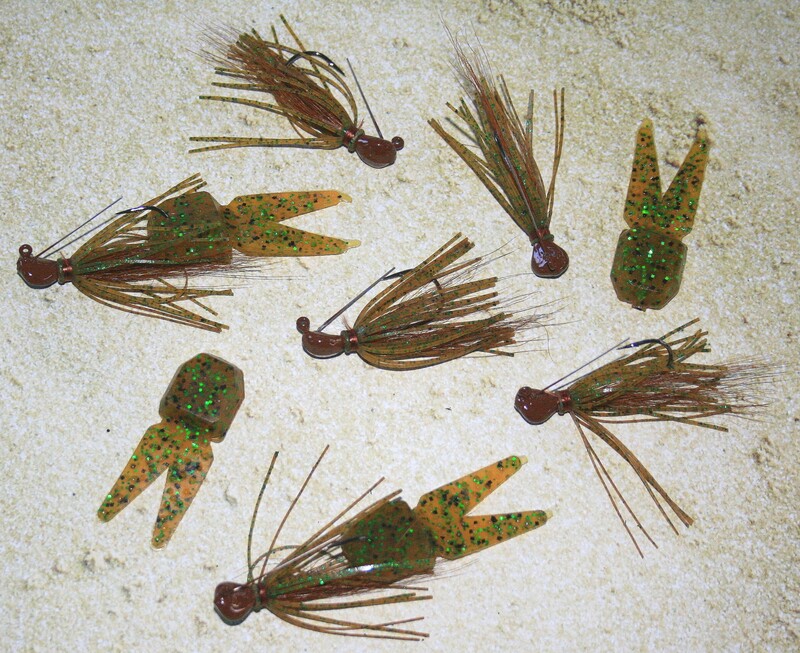 If you’d like to try these flies in your home waters, contact Rodney Williams with R&S Bait Company at 423-791-2180. They offer a variety of fly colors and head weights to meet any anglers need. We enjoyed some fine fishing in the cool night air under the new moon and star-studded sky. 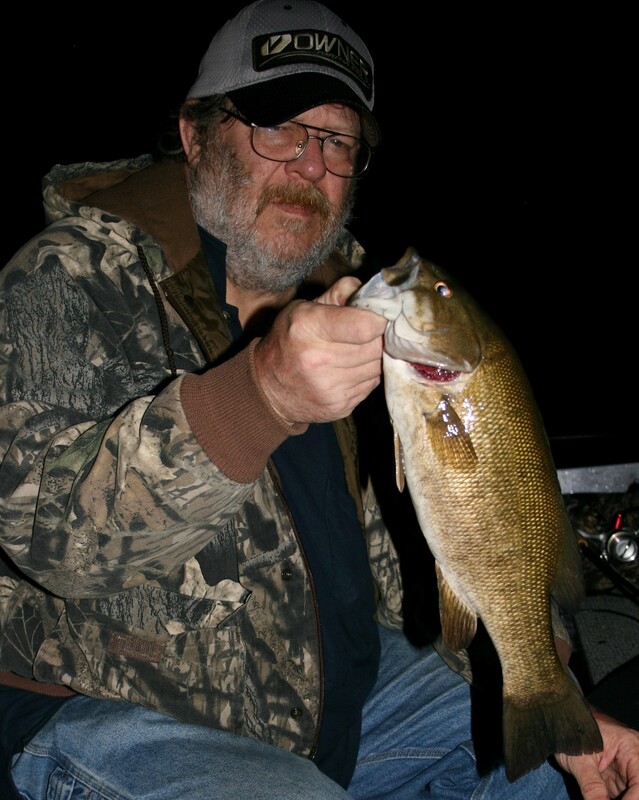 Smallmouths became active a couple hours after sunset and hit our jigs all night. It’s easy to lose track of time when power-house chunks like these are up and hitting. I love the picture of the lake and would like to link to it on my blog, if that’s okay with you. I grew up on South Holston lake. It’s one of my favorite places in the world! You’re most welcome to link to that picture if you like it. 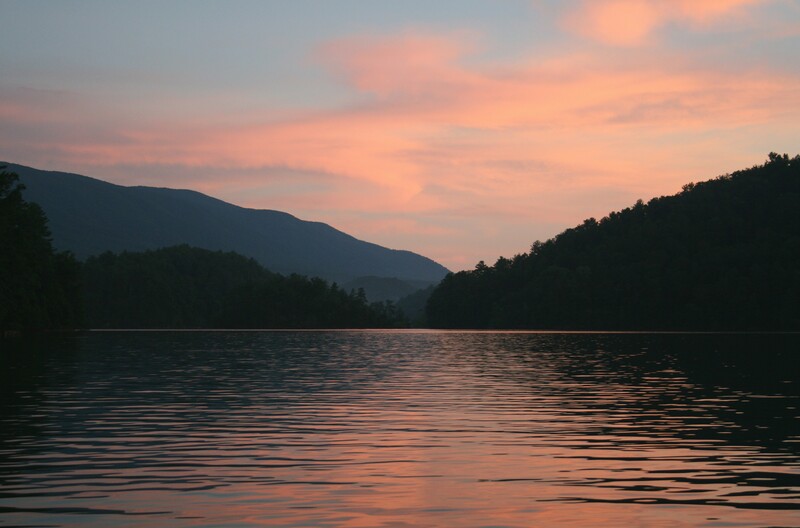 South Holston is my favorite lake in this region so I share your feelings. Beautiful clear aqua-blue water, little development, picturesque mountains along the eastern shores, plentiful wildlife and great fishing combine to make it a very special place. Check back from time to time because I’ll be posting more pictures of scenic South Holston Lake in the future. Great web site and very good pictures and what lures to use. I grew up in WV and lived there most of my life until I retired and moved to FL. Now I live near Crossville TN and I would be interested in fishing with you on some near-by lake sometime. Where in WV did you learn to fish? Thank you for the kind compliments Mr. Carpenter. I always enjoy hearing from fellow Mountaineers. I grew up in northern West Virginia in Bridgeport and learned to fish pursuing trout in the many streams, ponds and lakes scattered across the state. 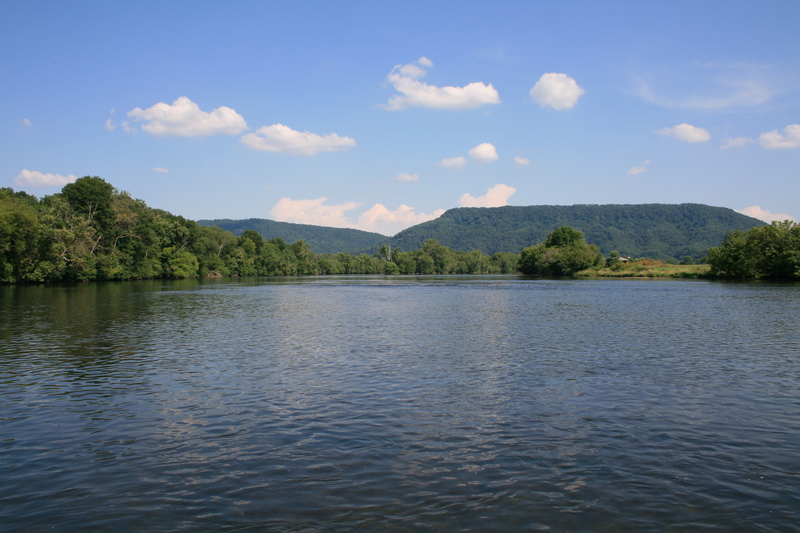 The area I fished most, and one that is still very special to me, is the Potomac Highlands region along the eastern border of the state. As I’m sure you know it’s a trout angler’s paradise hidden along the crest of the Appalachian Mountains. My Father-In-Law had a camper on the East Fork of the Greenbrier River in Pocahontas County and that was the center point for much of my trout fishing education. I’d enjoy meeting you some time, swapping stories about fishing, and perhaps wetting a line. 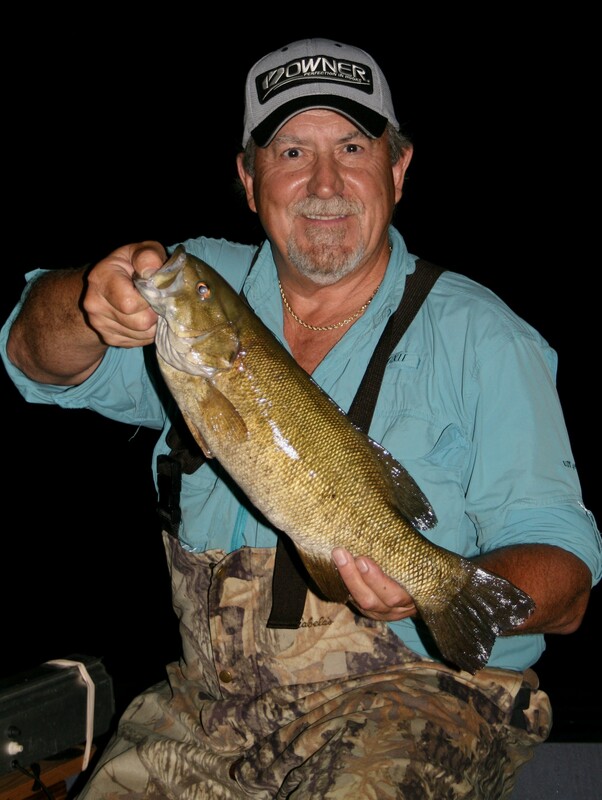 The best way to connect with me is through Facebook at Weekend Angler or by email at theweekendangler1@gmail.com.